Andersen Two and Three Speed electric winches are the perfect solution for larger boats, of 16m (60ft) or more, providing the power and control to safely hoist and trim sails of any size at the push of a button. In addition to the host of standard features that have made Andersen self tailing winches the benchmark for quality and performance, Andersen Two and Three Speed Electric Winches are engineered with unsurpassed levels of functionality, monitoring and protection. 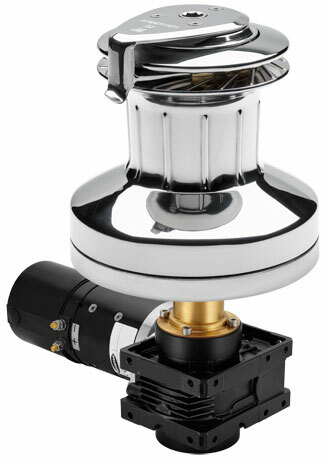 At the heart of each Andersen Two and Three Speed electric winch is a powerful European engineered and manufactured series wound motor. Carefully matched with the optimum gearbox these winches deliver high speed at low load for fast sheeting in, and low speed at high load for safe, fine tuning when trimming. For maximum performance and efficiency they are supplied in a 24 volt version, providing smooth operation across a wide working load range. Two and Three Speed electric winches are supplied with push buttons with integrated LED which illuminates when power to the winch system is on. The push button incorporates a hinged safety cover to prevent inadvertent winch operation and is water resistant rated to IP67. The push button also acts with the controller to flash status codes that assist with trouble shooting in the event of overload or where other system protection intervention occurs. A cable for connection of the push button is included for convenient installation. Integrated Overload Protection The controller is pre-set to stop the winch if the Maximum Pull Load is exceeded. Operation can resume within a few seconds when the load returns below the limit. Reverse Polarity Protection – An integrated 5 Amp fuse protects the controller against incorrect cable connection. Low Voltage Detection – Operation is disabled if the battery charge level is low, which prevents further drain on batteries and avoids triggering low-voltage reset of navigation instruments and other electronic devices. Continuous Run Time Limit – Operation is disabled if continuous run time exceeds 10 minutes. Manual operation is always available as a backup; or just for the experience. Andersen Two and Three Speed Electric Winches are supplied complete with push buttons, electrics/control box (110ST Two Speed only) and comprehensive installation and operation instructions. The RA590150 150A Amp Circuit Breaker is recommended for use with 82-3ST and 110ST Electric Winches – sold separately.